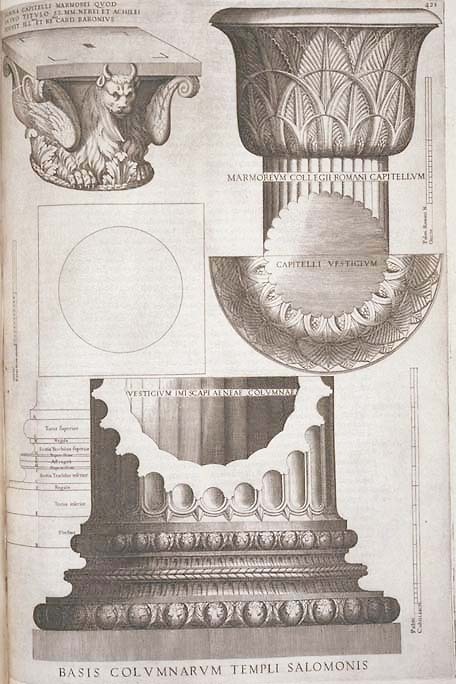 Figure 48 Villalpando’s drawing, in section, of his extravagant design for the Temple, based on classical lines – an attempt in part to demonstrate the Judeo-Christian credentials of the pagan orders. Catalogue no.51, plate facing p.145. Perhaps the most famous and most controversial reconstruction of the Temple in the period was that due to the Spanish Jesuit Juan Bautista Villalpando. With fellow Jesuit Hieronymo Prado he began what would become a huge three-volume commentary on Ezekiel. However, after the first volume was published a dispute over the reconstruction of the Temple delayed further publication and, with the death of Prado, Villalpando worked on alone. Volume two, which appeared in 1605, contains his extraordinary illustrations of the Temple as a vast Renaissance palace in the classical idiom. The account was derived from Ezekiel’s vision, but for Villalpando this was a guide also to Solomon’s Temple, since both were designed by God. With God as architect, the design of the Temple will reflect his other creations: the macrocosm of the world and the microcosm of man. Thus Villalpando incorporates aspects of the harmony and order of the heavens into the Temple, while its proportions also encode those of the human body. All these hidden relationships are derived from Ezekiel and expounded in detail. The result has a general and a specific role of apology in relation to sacred architecture. It justi fies the use of the classical orders, since their ultimate source was the Temple of Solomon: it was this divine architecture that came down to Vitruvius, along with the idea that the orders reflect human proportions. More specifically, it justifies the design of El Escorial and the extravagant ambitions of Phillip II for his spectacular palace. In both volume two and three, Villalpando takes Ezekiel’s description of the Temple, with its many detailed measurements, as the occasion for a mathema tical treatise. The third volume, as well as dealing with the position of the Temple and the topography of Jerusalem, considers the ancient Hebrew weights and meas ures, since Ezekiel not only describes measurement with particular types and combinations of cubit, but was also instructed in the importance of ‘just balances’ and consistent standards of weight and of dry and liquid measure. 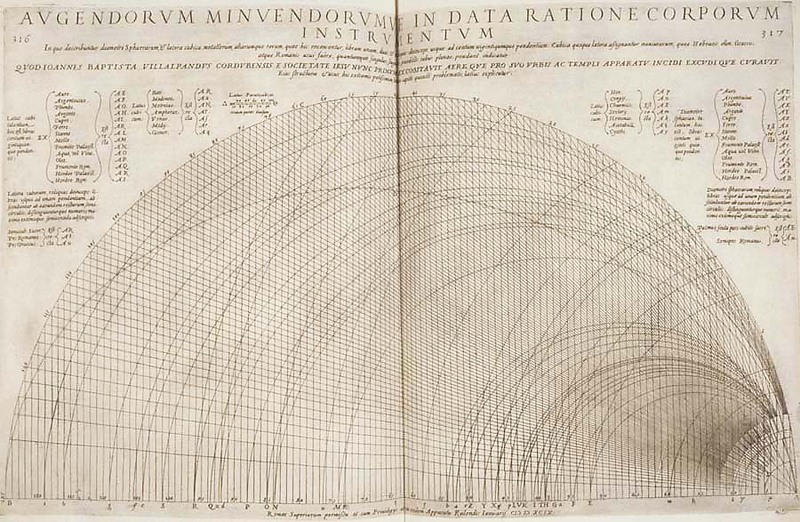 As part of his comparative treatment of Hebrew, Greek and Roman measures, Villalpando announces the design of a mathematical instrument for determining the volumes of spheres and cubes and the weights of solid figures of different sizes. Kircherus, Scheinerus etc apply Mathematics to Experiments and Mechanicks, etc. They are right Iesuits to make a great blaze of all things etc so as to attract more admirers and contributors to their Order. G. Kubler, Building the Escorial (Princeton, 1982); J.A. Ramirez (ed. ), Dios arquitecto: J.B. Villalpando y el templo de Salomón (Madrid, 1994); H. Rosenau, Vision of the Temple: the Image of the Temple of Jerusalem in Judaism and Christianity (London, 1979); R. Taylor, ‘Architecture and Magic: Considerations on the Idea of the Escorial’, in D. Fraser, H. Hibbard and M.J. Lewine (eds. ), Essays Presented to Rudolf Wittkower (2 parts, London, 1967), part 1, pp. 81–109.